Amy Leahy, 19, from Ciente salon in High Street, Berkhamsted, was thrilled to be named the winner in the Latest Fashion category of the Central Training Group photographic hair competition. While recovering the shock of being named a category winner, Amy was overcome to hear she had won the overall trophy for the young hairdresser displaying the best attitude, team support and overall outstanding. The Joshua Galvin Cup, named after one of the hairdressing training organisation’s founders and icon, is given to someone who shows outstanding commitment and a positive attitude to their work. Amy said: “I was incredibly pleased to win the category let alone the cup! 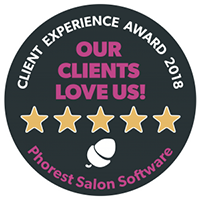 Amy’s boss, Trish Buller who is the director of Ciente and the Arrocca Hairdressing training School, Berkhamsted, where Amy completed her training, was also thrilled by her learner and team member achieving the double. She said: “Amy is very creative and is always looking ahead for inspiration and ideas in the world of fashion. She was the only one in her category to go for a short hair style with really imaginative colour work which appealed to the judges. For more information, please contact Trish Buller on 01442 877273/01442 767101. The attached pictures shows Amy with her model collecting her trophies from Martin Kolton, left, Chairman of Central Training Group and hairdresser Daniel Galvin, right, and Amy receiving the Joshua Galvin Cup from hairdresser, Daniel Glavin.